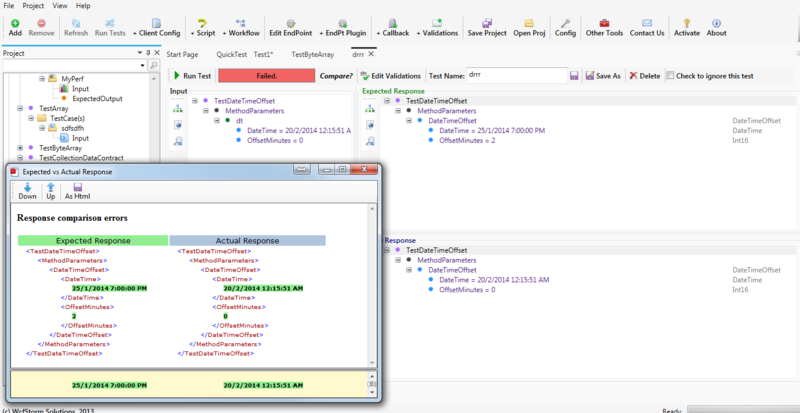 By default WcfStorm does a field-by-field comparison of the actual and expected response of a functional test case. This behavior is appropriate for a large number of scenarios. However, in some cases however, you might want to have control the validation process. For example, let's say you have a WCF service that returns a GUID parameter which is generated everytime the method is invoked. If you've created a test case for this method, then the test case would always "fail" because the GUID in the expected response will never match the one coming from the actual response. Having full control on the validation process makes sense for such a scenario. This property is used to indicate that the plugin will override (set to True) or supplement (set to False) the validation. Let's say we have the simple WCF service below and we'd like to write custom validations for the method "GetDataUsingDataContract". We'd like to validate that comp.StringValue is a concatenation of the stringValue and booleanValue input paramaters. For this, we'll create a custom validation. Create a C# library project. Reference WcfStorm.Plugins.dll (located in the same folder as wcfstorm.exe) and set Copy Local to True. Custom validation methods return a boolean (true, means validation is successful) and is decorated with the TestCaseValidator attribute. This atrribute requires the MethodName and TestCaseName. The TestCaseName value should match the value of the test case created in step #1. Below is the implementation of the "ValidateGetDataUsingDataContract_FieldsMatch" function which checks that the comp.StringValue is the concatenation of the boolean and string input parameters. Execute the functional test case.